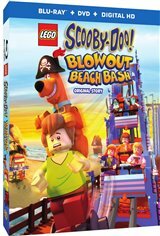 Scooby-Doo and his friends Fred (Frank Welker), Daphne (Grey DeLisle), Velma (Kate Micucci) and Shaggy (Matthew Lillard) are on their way to Blowout Beach for a fantastic beach party in the Mystery Machine. Unfortunately, the Ghost Pirates threaten to ruin the gang’s party. It's up to Scooby and the gang to get the party back on track.